What BEAUTY products I got Mom for Mother’s Day. Hello and Happy Mother’s Day! While every day should be Mother’s Day, as a mother’s love never ceases even for a second, the second Sunday of May is dedicated to celebrate all mother’s love, accomplishments, and all their hard work! It’s not out of norms for me to pick up something here and there for my mother whenever I see something suitable for her. But for this special day every year, I’d like to pick out something for her to show my appreciation, in addition to the dinner that my S.O and I treat her every year. I’ve got to say, mothers are probably the hardest working super heroes around! AND they are also women. So of course they will always have the love of beauty. They love beautiful things and they also love to be beautiful themselves! That’s why I usually put on my thinking cap and get them something beautiful, which they well deserve OR I would get them something that could keep their radiant beauty in check! This year, I went with KORRES line of skin care products! What gorgeous line up! 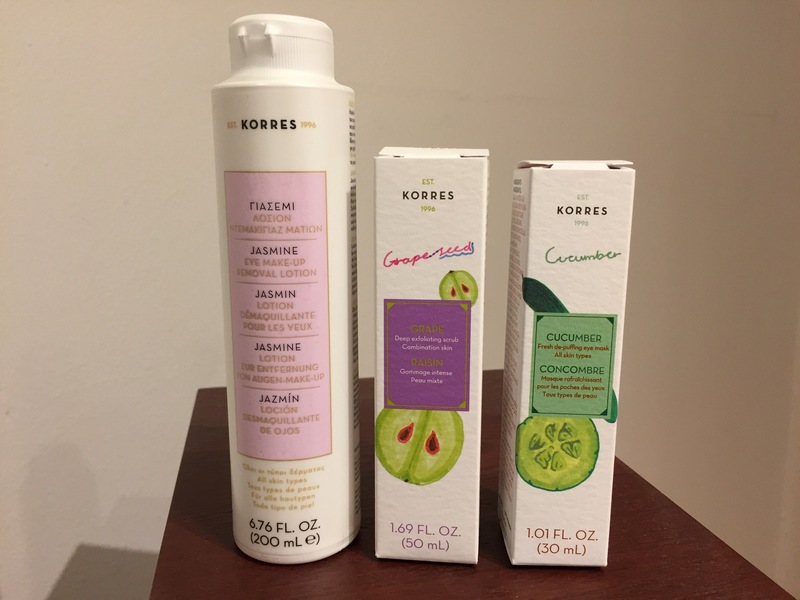 I’m not a familiar user of KORRES, but I’ve heard plenty of wonderful things about them. And guess what… I stumbled upon a sale that they had one day when I was just strolling the city. Perfect and just in time for Mother’s Day! I decided to give them a try! The Jasmine lotion removes eye make-up and waterproof mascara, without irritating the delicate eye area. Wheat proteins and provitamin B5 moisturise the skin and constitute an excellent eyelashes’ strengthener. Jasmine, Cucumber and Calendula offer combined soothing and refreshing action. Apply with cotton wool, gently working inwards from the outer corner of the eye. 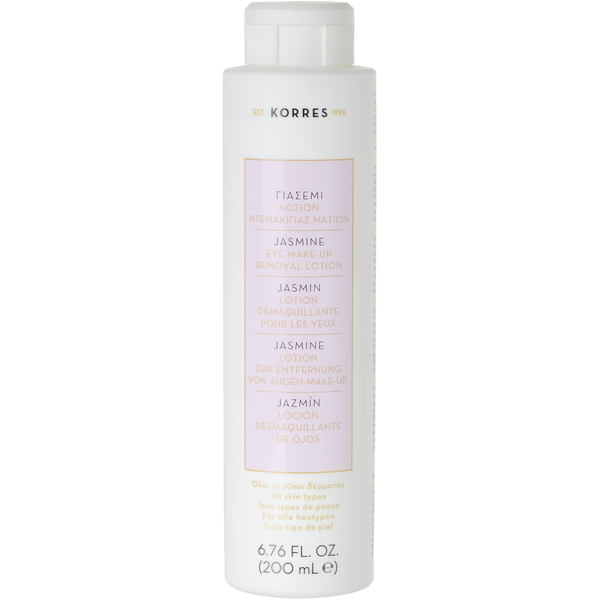 First on the list was this Jasmine Lotion Make up Remover. I read many reviews online before the purchase and I found it to be an average Make Up Remover. However, what was good about it was that the ingredients were over 80% natural and no harsh chemicals – such as parabens and sulfates! I thought WHY NOT?! A creamy luxurious exfoliator that effectively cleanses, unclogs pores and helps remove excess sebum. This intense mechanical scrub resurfaces the skin, removing impurities and dead skin cells, leaving the skin clean and smooth. – Aloe Barbadensis Leaf Juice: Soothes skin. – Sweet Almond Oil: Soothes and nourishes skin. – Apply to clean wet skin, avoiding the eye area. – Massage gently and rinse off thoroughly. – Use 2-3 times weekly. Okay! Exfoliator is a MUST HAVE! This exfoliating scrub promises a lot and the key ingredients definitely made me say YES! Plus, the price was damn right. It is currently retailing online for $10 USD, which is a price cut from it’s original $15 USD! Fresh de-puffing eye mask that makes the delicate eye area look healthier. A refreshing gel mask that hydrates and detoxifies the delicate eye area, and formulated with cucumber, calendula and chamomile extracts to help reduce puffiness and signs of fatigue. – Apply a thin layer under the eyes, avoiding direct contact with the eyes. – Leave for 10-15 minutes and rinse off thoroughly. I think for mothers. Eye masks are MUST HAVES! They just spend so much time, energy, effort on us through out the years! All those sleepless nights too! I’ve heard this was a great pick me up! So the last item I decided to get was this! I know my mom bought a ton of facial moisturizers and masks recently so I skipped all that and went done to the basics of skin care. Hopefully my mom would like the gift I picked out for her and I surely hope these products will live up to it’s reputation! I will definitely write back about them and give a thorough review! And until then… what did YOU get for your mother this Mother’s Day? Comment and let me know! I’d love to get some new ideas for the coming year! Previous Post Beauty Blogger Tag! GO GO GO! The Eye Make-Up Remover catches my attention. I think the product is effective, so checking this out. That’s great! I’ve been using it as well. I don’t think it’s very effective against water proof make up because it’s very gentle. But on the other hand. I can use it on my whole face and feel refreshed! Love this post, I have decided to do something special for my mom this year too. I am going to order her a few of my favorite things from an organic brand that I promote. I just love doing things for her all the time, but especially on this day.